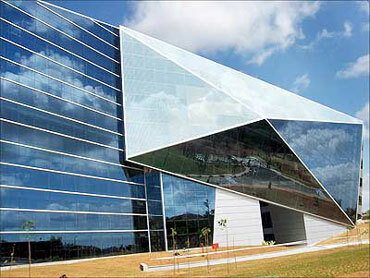 Infosys Technologies on Thursday reported 14.17 per cent growth in consolidated net profit at Rs 1,780 crore for the third quarter ended December 31, 2010. The company had a net profit of Rs 1,559 crore (Rs 15.59 billion) in the December quarter of the previous fiscal (2009-10), Infosys said in a filing to the Bombay Stock Exchange. 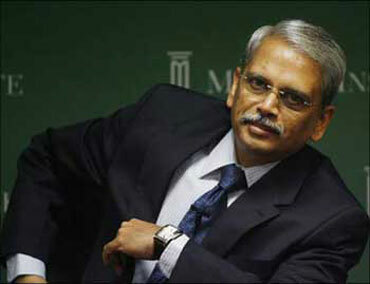 Image: Infosys CEO S Gopalakrishnan. Company's consolidated revenues came in at Rs 7,106 crore (Rs 71.06 billion) from Rs 6,947 crore (Rs 69.47 billion), up just 2.29 per cent on QoQ. Operating profit margin came in flat at 30.2 per cent on quarter-on-quarter basis. Growth from retail segment came in at 6.6 per cent in December quarter. Banking, Financial Services and Insurance growth was at 8.3 per cent and manufacturing growth at 9.8 per cent in same quarter. "The weaker economic recovery in developed markets coupled with high unemployment and risk of sovereign default could impact industry growth. We are closely working with our clients, as they fine tune their strategies for the future," Infosys chief executive officer and managing director S Gopalakrishnan said. For the Q4 ending March 31, the company expects the revenues to be in the range of Rs 7157- Rs 7,230 crore (Rs 71.57-72.3 billion), while it anticipates the revenue for the full year ending March 31, 2011, in the range of Rs 27,408- Rs 27,481 crore (Rs 274.08-274.81 billion). Besides, the company has appointed R Seshasayee as an additional director with immediate effect. The appointment is subject to the shareholders approval. On the standalone basis, the company has reported 11.55 per cent growth in its net profit at Rs 1,641 crore (Rs 16.41 billion) in Q3 2010-11, over the same period in the previous fiscal. Income rose to Rs 6,534 crore (Rs 65.34 billion) in the October-December quarter, against Rs 5,335 crore (Rs 53.35 billion) in the same period last fiscal. The company added 5,311 employees in October-December quarter of 2010, taking its total headcount to 127,000. The company hired 11,067 employees in the third quarter this fiscal, but nearly 5,756 employees left the organisation during the same period, bringing the net addition at 5,311, the company said in a filing to the Bombay Stock Exchange. "Our attrition has reduced. The employee engagement programme has shown good results. Employee referrals are at an all time high. Lateral hiring are a record this quarter," Infosys Member of the Board and Head HRD and Education & Research TV Mohandas Pai said. 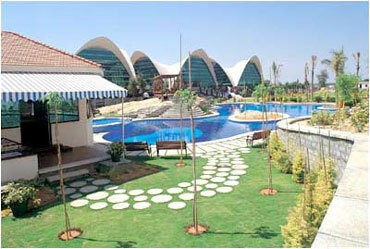 Infosys CFO SD Shibulal added, "After the slowdown attrition went up. But now this has stabilised and is not that big a concern.The industry has always been able to manage it." However, according to the filing, the company's attrition rate (last 12 months basis) stood at 17.5 per cent in the third quarter of this fiscal compared to 17.1 per cent in the preceding quarter. 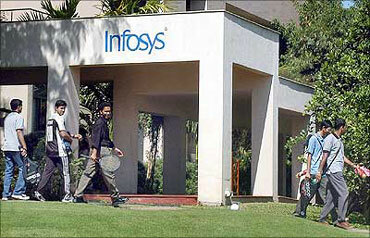 As on December 31, 2010, Infosys and its subsidiaries employed a total of 1,27,779 people compared to 1,09,882 at the end of December 31, 2009, it added. "Hiring at entry level is not that difficult, but hiring experienced people is a challenge since we are picking up people from other companies. 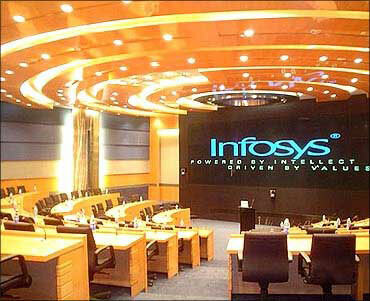 It is like a musical chair that goes on," Infosys CEO and MD S Gopalakrishnan said. The company, which counts BT Group, BP Plc and Goldman Sachs among its clients, said it has added 40 clients during the quarter taking its total active clientele to 612. BSE launches Islamic index; what is it?